SchoolCity SUITE allows users at all levels to create groups of students and courses for various purposes. While a Student Group is a group of students within a classroom or course, a Course Group is a group of courses or classes. Depending on the user role, a Course Group may include only the courses assigned to one teacher, or may include similar courses in a school or district. This document will review the process for managing Student Groups and Course Groups. 1. From the SchoolCity SUITE Launchpad, click on the Lines icon on the far right of the Top Menu Bar (1a), then select Groups (1b). a. Group Year: Select the school year in which the group was created. b. Select the Student Group tab. c. Student Groups you have created will be listed with an open box, the Group Number, Group Name, Number of Students, Created By, Date Created, and Date Edited. d. Your group can be edited, copied, deleted, and renamed using the Functions (See Steps 6-10). e. For District and School Level users, Student Groups may be created and kept Private (only the creator can view), Semi-Private (only selected users can view), or Public (all users can view). f. Teacher Users, when a School or District Users shares a group semi-privately or publicly with you, it will appear on your list without box next to the Student Group name, and only a View (eye) icon. You cannot make any edits to this Student Group. a. Group Year: Select the school year in which the Course Group was created. b. Select the Course Group tab. c. Course Groups you have created will be listed with an open box, the Group Number, Course Group Name, Number of Courses in the group, Created By, Date Created, and Date Edited. d. Course Groups can be edited, copied, deleted, and renamed using the Functions icons (See Steps 6-10). d. Course Groups can be edited, copied, deleted, and renamed using the Functions icons (See Steps 6-11). e. District and School Level users, Course Groups may be created and kept Private (only the creator can view), Semi-Private (only selected users can view), or Public (all users can view). f. Teacher Users, when a School or District Users shares a group semi-privately or publicly with you, it will appear on your list without box next to the Course Group name, and only a View (eye) icon. You cannot make any edits to this Course Group. 6. 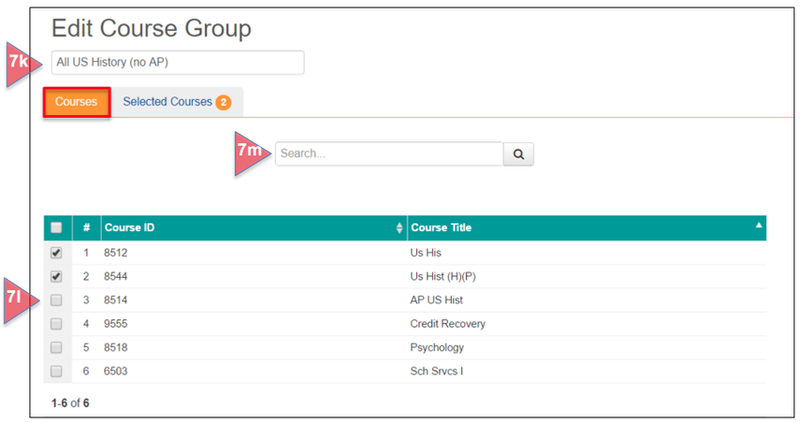 Functions: Student Groups and Course Groups can be managed using the Function icons. From left to right, the functions are Setup (gear icon) (See Step 7), Copy (2 pages icon) (See Step 8), Delete (trash can icon) (See Step 9), and Rename (capital A icon) (See Step 10). a. Select the Student Group tab, and click on the gear icon next to the group name you wish to edit. b. Edit the Student Group Name, if desired. d. Show/Hide Filters: Click on Show Filters to view the selection criteria. The chosen criteria will appear in a light blue background. Click on Hide Filters to close this view. e. Change Filters: Click on Change Filters to modify the selection criteria. f. Use the drop down boxes in each section to find the desired set of students for the group. g. Automatically Update: (Default Yes) Select Yes if you do want automatic additions of new students who match the group criteria. Select No if you do not want automatic additions to the group. h. Always Run with Roster Data: (Default Yes) Select Yes if you want the roster to determine which student records are available when viewing reports. Select No if you want the roster validation to be removed so all users with access to the group can see data for all students in the group. i. Save, Show Students, or Cancel: Click Save to save your work for later, Show Students to view the list of students who meet the newly selected criteria and add them to the group, or Cancel. Repeat the selection process as necessary. j. Edit a Course Group: Select the Course Group tab, and click on the gear icon next to the group name you wish to edit. k. Edit the Course Group Name, if desired. l. By default, the list of all courses will be shown under the Courses tab. Add new courses to the Group by checking the box next to the Course ID and Name, or delete a course by unchecking the box next to the Course ID and Name. m. Use the Search box to find courses. n. Click on the Selected Courses tab to view the new Course Group. o. Update & Save or Cancel: Click on Update & Save to save the new Course Group, or Cancel. a. Identify the Student Group you wish to copy, and click on the Copy icon. b. Give the Group a new name and click on Save. c. A message will appear confirming this action. Click OK to continue. e. Copy a Course Group: Identify the Course Group you wish to copy, and click on the Copy icon. f. Give the Course Group a new name and click on Save. g. A message will appear confirming this action. Click OK to continue. h. The new group will now appear in your My Groups list underneath the original group. Both groups can be edited by clicking on the setup icon (See Step 7). a. Identify the Student Group or Course Group you wish to delete, and click on the Delete icon. b. A message will appear asking you to confirm this action. Click OK or Cancel. c. A second message will appear confirming the deletion of the group. Click OK to continue. 10. Rename: This allows you to quickly rename a Student Group or Course Group without going to the Edit Group screen. a. 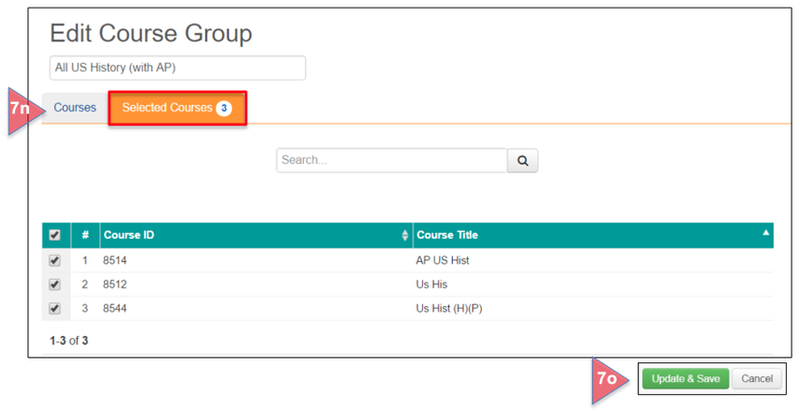 Identify the Student Group or Course Group you wish to rename, and click on the Rename icon. b. Edit the name as needed. Click on Save or Cancel. 11. Bulk Shortcuts: Use these icons to Copy or Delete one or more Student Group or Course Group. a. Select the Groups you wish to copy or delete by checking the box next to each Group Number and Name. b. Select the desired action by clicking on the Copy or Delete icon. Follow the directions as explained in the corresponding steps above. Please refer to the Help documents, Groups: Creating Student Groups and Creating Course Groups for more information.